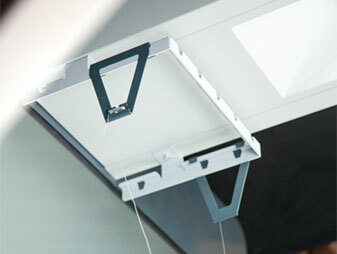 The Podium is designed as the perfect companion for StyleShoots Vertical. Dock it against the backwall, and you are able to easily photograph shoes, bags, hats and more. Designed for fashion items, the software of StyleShoots Vertical automatically cuts away the background. Top surface illuminates when docked into StyleShoots Vertical, automatically cutting away the background from common fashion products. The perfect combination of strength, durability and style. Solid birch multiplex with melamine sides. Two large shelves, each spacious enough to store an entire mannequin torso. Or 10 pairs of shoes. Front locking wheels, so you can securely use the Podium as handy storage in between shoots. 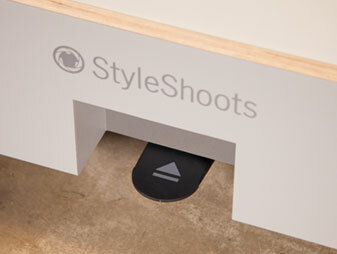 Eject Pedal to undock the Podium from the backwall of StyleShoots Vertical. Mount the Top Rail onto StyleShoots Vertical and use it to aid your styling. Certified birch multiplex panels with melamine sides. Swivel castors. Front castors with rotation lock pedals. StyleShoots Vertical running software 3.0 or later. Get in touch with a member of our team to learn how the Podium together with StyleShoots Vertical can speed up your product photography process.